TIGHT! Or: Doctor Soul meets Jimmy Smith! Milano, 20-25 May 2003: at the sumptous and velvety "Blue Note" club of Milano (how long a place like this will resist?) 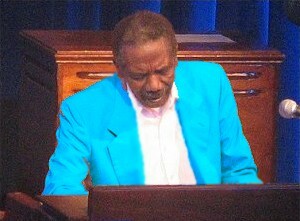 lands a COLOSSUS of the HISTORY of MUSIC: Jimmy Smith. To me it's a chance I cannot miss, although fearing some delusion due to the advance age of the mythical organ-player; extricating myself in a personal agenda filled of duties, I choose the second show for Thursday 22 May, hoping that Jimmy should be able to thrill also late at night (beginning h.23:30). The band is top-level, and in 75 minutes of show they enumerate a well assorted catalogue of tracks, that are appreciable even for non jazz-fanatics; the HAMMOND MESSIAH is hesitating when he walks to the trusted instrument, but arthritis doesn't keep him from offering some captivating grooves with his glorious right hand, delivering in-between jokes at the microphone in front of a qualified and passionate crowd. The DESTINY wanted that the table where I was gently addressed by the maitre of the club was at a few CENTIMETERS from the point of passage for the band from dressing rooms to the stage: a very good viewpoint but most of all (and here begins the unforgettable part of the story) optimal for the interception of Mr. Smith at the end of the show: an opportunity not to be missed to hold that right hand which I admire like few other things in this world. ...And the meeting happens! After a few seconds of handshaking, I pull away diligently my hand but... he hinder me to do it! His hold is strong; I hesitate but he looks into my eyes and he summons "Tight! ", challenging me to use more energy; I answer "Tighter? ", trying to make him understand that I have absolutely no intention to become "the one who, with a not-so-respectful handshake, ended the third-age career of the greatest Hammondist of all times", and he reacts to my question by squeezing my hand with additional unexpected energy! So I tell him "You're too strong for me!" and he begins decreasing the squeeze-power while smiling at me; then he simulates an organ solo with his precious hand that just released mine, and I add "...even in playing!" to my previously expressed concept. He salutes me and slowly starts climbing the stairs that bring to the dressing rooms, while I look at my hand in which now flows the FORCE (in biblical or Star Wars sense, whatever you prefer). I decided that my blessed limb since today will be used to thaumaturgically soothe the pain of the fans of good music, pincered by continuous bombing of commercial music and bad lucks of any kind. PS: to be honest, for me it would have been enough to receive the gift of a bit of his talent, to be poured off over a keyboard. PPS: the day after, maybe also because of tiredness (at his age I think it's hard to hold the weight of two shows per day for a full week in a row) the myth will have a weak night: according to what has been witnessed to me by some people who attended the show (including Mike Painter), he will get angry due to some immoderate (and unauthorized) photographers and will react not so gently, influencing his performance as well. This makes even more precious the episode I lived! PPPS: Jimmy has gone away on Tuesday 8 February 2005. Just thinking back to the event described above, my eyes become watering and my skin is crossed by a gentle chill. I suppose that over there he should have found his cat waiting, crouched over the top of the Hammond "G.O.D.3" (an exclusive model which I won't hesitate to define as a divine one) while taking some breeze from the rotating horns of the Leslie speaker model "St. James" connected to it.